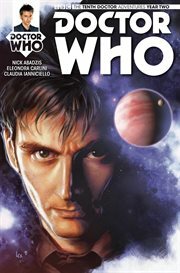 The item Doctor Who, Issue 2.2, The Tenth Doctor, Nick Abadzis, Eleonora Carlini and Claudia Ianniciello, (electronic resource) represents a specific, individual, material embodiment of a distinct intellectual or artistic creation found in Richland Library. DEATH -- THE ULTIMATE EARWORM! It's chaos aboard Presley Station, as the corrupted Shan'tee - conceptual beings from a different order of reality - prey on the human colonists, while on the gas giant below, vast storms conjure up winds of horrifying speed -- that threaten to tear the Station apart! Caught in the middle of the chaos: the Doctor and Gabby! Can the Doctor find the counter-melody that brings peace back to the Station? And can the ever-humming Gabby keep herself from singing - to stop her mind being invaded by a sentient song?! Meanwhile, back on Earth, Cindy makes up her mind... And in deep space, an old face comes calling...!